I previously posted about Saddam's wartime document preservation strategy ("When we are in a war, important documents must have two copies in two different locations. What if this location is bombed or burned?) as well as a wartime document evacuation order ("In preparation for any foreign attack (God forbid) be prepared to disperse documents from headquarters to private residences in various geographic locations"). 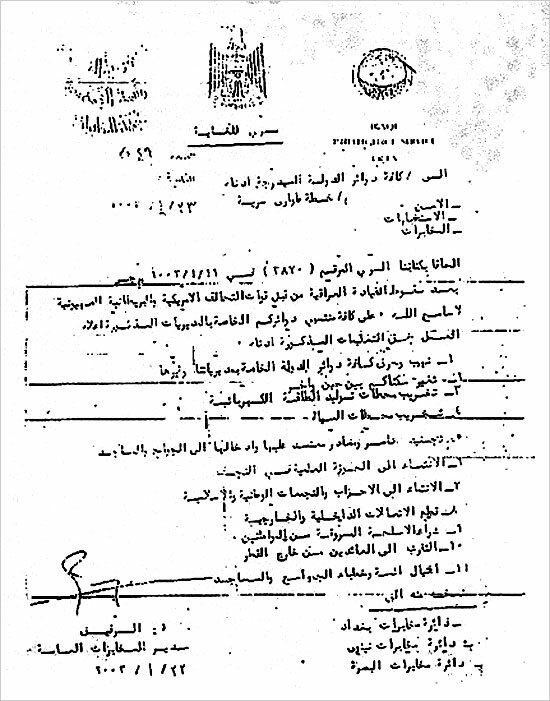 Thanks to Nate Jones and the National Security Archive we now also have a full document destruction order available on Unredacted in a post called "Declassified Iraqi Memo Points to the Genesis of the Insurgency." 1- Demolish and burn all offices in the country, especially [those] associated with ours and other departments. 2- Change your residence from time to time. 3- Sabotage electrical power stations. 5- Recruit reliable sources and direct them to the mosques. 7- Associate with the national and Islamic groups and parties. 8- Cease all internal and external communications. 9- Purchase stolen weapons from the public. 10- Develop relationships with those returning from abroad. A couple of points about this document. As a general rule, captured and acquired documents and media are considered unclassified unless they originated in the US and/or an allied nation and are marked as classified. Capturing units may classify document and media to protect sources and methods or on-going operations, however, such classification should be kept to the lowest level possible and with minimal use of caveats. Documents that bear foreign classification markings are handled according to US classification standards, regardless of their original foreign classification. In an earlier article (see pp. 1033-34), I cited the first ordered action in this document (based on the Al Hayat version) - "Demolish and burn all offices in the country" - to highlight the precarious position of government documents on the eve of foreign attack. As the great Ernst Posner wrote, defending nations "have discovered that in their fight against the conqueror the destruction of records may be a weapon as powerful as the dynamiting of railroads and the blowing up of bridges." At those times it is the attacking forces that often have more of an interest in preserving the documents intact and the greatest danger of destruction may come from the government that created them. Thanks again to the National Security Archive. I have added the original and translation to the Captured Documents Index under its Harmony number CMPC-2003-016373.